The phrase "stay at home mom" has had many adaptations through the years. Let's face it, it's even been rephrased into "stay at home dads." Well, I am a "SAHM" in every sense of the phrase, but even more so lately. Tomorrow will mark the four week birthday of our newest addition, Maria Fiorella, who we affectionately call "baby Mia" or "our little flower." Life has been a filled with an abundance of love and exhaustion lately, neither of which I can complain about considering our little blessing arrived perfectly healthy! We are so excited to have another baby girl in the house, but it HAS made us stay exactly there - in the house! Outings with three children and a newborn is not on my 'to do list' just yet, so we've been thinking of a lot of "stay at home" activities for our family to enjoy together. This way, the other kids don't feel like they got a raw deal when #4 came along! Our latest endeavor was a day full of homemade bread and pizza dough. Okay we cheated on the pizza dough and used the bread machine (my new favorite invention, by the way) but it was pretty darn good nonetheless! We then topped our pizza with some homemade marinara and fresh mozarella. It may have looked like a bunch of kids put it together, but it tasted like a bunch of 100% Italian Nonnas labored over it for hours! Excuse me, do I see eggs in the first photo? Do you put eggs in the pizza dough? ELENA - Great observation!!! 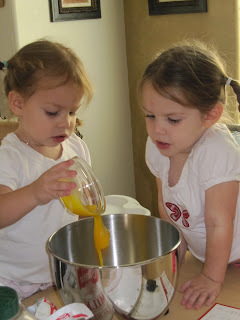 I believe, looking back, that I might have mistakeny added a photo of the girls making homemade soft pretzel dough (which we made the same day as the pizza dough!) So sorry for the confusion - mi dispiace! No eggs in this pizza dough recipe - let me know if you're interested in the ingredients and I'll do a post just for you! CIAO! and thanks for reading! Thank you for replying! I have a great pizza dough recipe and was surprised by the eggs in the photo. BTW, beautiful kids! Ciao!